Copyright© 2011 Kovach Architects. All rights reserved. Q: What is the Soap Lake Lava®Lamp? A massive, technologically unique version of the iconic and classic 1963 Lava®Lamp. A "beacon" to bring attention to local and regional history, geology, arts and culture. A catalyst for new economic growth, community spirit, and improved quality of life. An art installation and new venue for multi media artists and filmmakers to create visual imagery performances. Q: Is this the lamp donated by the Target Company? A: No. The target lamp kept the idea alive over the years but proved to be too costly to reconstruct. The new lamp is much more cost effective, sustainable, and adaptable for advancing technologies. Q: What happened to the Target Lamp? A: The Target lamp is currently stored at the Public Works facilities yard. Components will be salvaged to the greatest extent possible, earnings will be held by the City for future use. Q: How is the project being paid for? A: Private donations by businesses, individuals, economic development organizations, charitable funds, and community grassroots fundraising efforts. Q: Who will own the Soap Lake Lava Lamp? A: The City, citizens, and community of Soap Lake. Q: How will it benefit the local economy? A: The world recognized iconic image will be a year round irresistible attraction that will encourage passersby to slow down and relax, visit and learn, explore and discover, and most of all enjoy all that Soap Lake and the surrounding Upper Columbia Basin region has to offer. Increased tourism, community involvement, and local visits will add an excitement that will boost the economy. Existing business will improve, new businesses will be possible, and new opportunities will arise to serve an active communities needs. Q: How tall is the Lava Lamp? A: 60 feet from ground to top of cap. Q: What is the Lava Lamp made of? A: The base is cast concrete, clad with graffiti resistant coated, metal oxide glazed porcelain tiles. The tension fabric "glass" portion is shaped with high tension stainless steel cables with stainless steel attachment assemblies. The enclosing weatherproof fabric scrim is fabricated from Tenara® by Sefar. This material is woven with fibers developed by W. L. Gore (manufactures of Gore-Tex). The fabric material has an expected useful life of 25 years and is naturally dust and dirt repellent, extremely tear resistant, and site weld-repairable. Q: Will there be any negative environmental effects on the lake or soils? A: No. The total installment footprint takes less ground space than 2 standard parking stalls and is completely weather proof, protecting all internal components from the elements. The sealed glazed tiles and fabric skin are completely inert. Water run off will be minimal and will quickly be absorbed into the ground. There has been no evidence of high water table, moving ground water, or springs in the site area. Q: Will the gusty winds be a problem for the lamp? A: No. The installation is structurally designed to withstand wind loads in excess of maximum recorded wind load conditions for the area. Q: Will the show always be the same? A: No. Current computer graphic technology allows unlimited variation much the same as experienced with the Lava®Lamp prototype. Q: Can you go inside? A: Access will primarily be for service personnel. Private tours will be available as part of ongoing fundraising efforts. Q: Will the Lamp be "on" all day? A: No. There will be a nightly showing starting at dusk and lasting one to two hours, with seasonal and special events programs for the benefit of the community. A: Four real time security cameras linked to the police department will monitor all activity in the immediate vicinity of the Lamp 24 hours a day, 7 days a week. Q: What if the power goes out? A: The solar power component is designed to provide all needed power for up to a 5 day period without sun or auxiliary power source. Q: Why locate the Lamp by the water? A: The Lamp is intended to act as a beacon much the same as a lighthouse might. The chosen location on the high rocky outcrop provides a striking setting for the sculptural form, visible for miles in many directions. The visibility is key to attract attention and encourage travelers to stop and explore. Q: What is the estimated cost? A: The project is divided into two major components, the Lava Lamp and the interpretive trail. 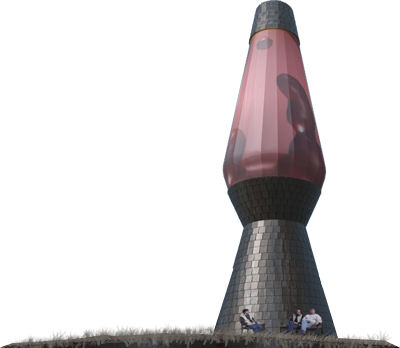 The construction cost for the Lava Lamp and the interpretive trail is about $750,000 each. Development costs, land costs, engineering and permitting fees, fiscal sponsorship fees, etc. will be another $250,000 each. Q: How much will it cost to operate and maintain? A: The Project will be self sustaining. It will utilize several revenue generating strategies to produce enough income for yearly operation, maintenance and improvements. Q: Why a Lava Lamp? A: Good question...actually there are several reasons. The iconic Lava®Lamp image is as recognizable as Seattle's Space Needle and has already been associated with the City of Soap Lake for almost 10 years. The lamp will be sited on basalt that overlays 14 million year old lava beds. The last historical heyday of Soap Lake occurred back in the early 1960's coincident with the invention and first appearance of the original Lava Lamp. The health benefits of the mineral qualities of Soap Lake is well documented and for nearly a century people have visited the small lake seeking relief for various ailments and skin disorders. Historically, it was a gathering place for native indians who revered its healing qualities and today popular interest in the holistic medicines has brought a renewed focus on these benefits. The "original" version of the Lava Lamp is valued for its meditative qualities and is now used for stress release and holistic treatment for many forms of mental disorders. Google has a signature Lava Lamp called "Google Lamp" found at many employee workstations. That meditative quality will also be exhibited by the Soap Lake Lava®Lamp. Q: Who is organizing the construction and installation? A: A team of professional Architects, Engineers, and Contractors. Q: Will it be very bright at night? A: No. The laser projectors operate at a very low wattage level and produce remarkably little light bleed. The images will be sharp and crisp but will add very little ambient light to the surrounding area. A primary mandate for the Lamp is no light pollution and the projects advanced laser technology makes this possible. Q: When will I be able to go see the Soap Lake Lava Lamp? A: Currently there is an open timeline for fundraising, but once funds are acquired the permitting and construction will take about a year. Q: Are there other local attractions or interesting things to do, or see, in the area? 1. Hiking, rock climbing, biking, birding, kayaking, sailing, fishing, hunting, golf. 2. Live theater, art galleries, indian culture, western history, holistic arts. 3. Wild flowers, wild life, geology, mineral mud, mineral baths. The Gorge Amphitheatre, Wild Horse Monument, Moses Lake and Ephrata Historical Museums, Ginkgo Petrified Forest State Park, Omak Stampede, Colville Revervation, and Regional Wineries to name a few. Q: How can I help get the Lava Lamp built? A: The most important aspect of our fundraising efforts is getting the word out and unveiling the community of interest! The number of people interested in being a part of this community is larger than one might think and spans well beyond the geographic boundaries of Soap Lake and Washington. Whatever your talent is, please write, draw, paint, talk, film, craft, and create your story about what this project means to you. We have numerous stories to share already which will be available at our Facebook Page. Follow us to hear our stories, share your own, and keep up to date with future opportunities for getting involved. Q: Im too busy to get involved, can I just donate? A: Please do. Contact the City of Soap Lake for donation opportunities. Learn more about the communities this project will promote.